Ok, so it didn’t happen. “Best laid plans” and all that. I got stuck at home uncovering the septic tank, cleaning the garage, sorting leftover lumber from the front porch project, etc. This week isn’t looking much better with the septic people coming, new rain gutters being installed, and other things that haven’t yet reared their heads. 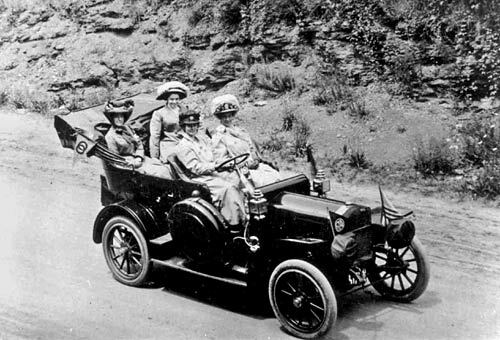 So instead I watched a DVD, “A Ride Along the Lincoln Highway” from WQED, a PBS station in Pittsburgh, PA. Highly recommended to all. I also watched the entire You Tube series, “Katie Across the Nation” which recounts a centennial run of Model T Fords from Coast to Coast. Also I read the story of the first woman to drive across the continent in 1909. She was twenty-two year old Alice Ramsey. This was at a time when such an undertaking was unheard of for a mere woman, but oh what an adventure it was. This entry was posted in Lincoln Highway and tagged Lincoln Highway, U.S. 40. Bookmark the permalink.